The last weekend both the kids wanted to eat something special and their very commonly used statement is 'Mummy, make something nice'. And if you ask them what 'nice' do they want there will be no explanation to it. They want to eat something which they can call 'yummy food'. So this clueless mom started thinking what could make the kids happy. Hubby dear had demanded that he be served hot roti or paratha for the meal. I asked him how does the idea of Naan appeal him? And he just gave a broad grin. If you remember, for my younger one's birthday I had ordered out, so this guilty mom has been compensating when ever she gets a chance. The menu was decided in my mind : Paneer and Naan, sounds good and makes everyone happy. Now the next question in my mind was which Paneer recipe? If I asked the kids my elder one will be clueless (he always has a problem deciding, too many things that he wants) and the younger one will stick to Paneer Butter Masala (and we all are bored of this demand but as promised to him I have to make it some day). So I decided to do some recipe hunt. I had a faint memory of reading Paneer Pasanda somewhere ...not able to recollect clearly I opened Sanjeev Kapoor's book on Paneer and I found what I had to make ...A rich Paneer Kaju Pasanda ..and this earlier clueless mother had all the clues now! I made some minor changes to the original recipe so as to suit our palate. Since the recipe demanded all high calorie things like cashews, deep frying and cream, I decided to use a non-stick pan to 'Bhuno' my masala using minimum oil. The end result was a big smile and praise from everyone and I was wondering why will it taste bad after adding so many goodies in it! Do try it if you are in a mood to indulge in rich cooking... and we all do that once in a while and if not, surely do it for the kids as you will get showered with hugs and kisses for this cooking (so was I) and that's what is our reward. Naan, I have made several times earlier, but every time I try a new recipe using the same ingredients in different proportions and the most commonly made substitution is that of wheat flour for all purpose flour. The Naan available in restaurants is made completely from all purpose flour (maida). This is not very healthy to eat and it's only good to eat when hot. It becomes very chewy if not consumed immediately. I have found during my experiments with Naan that adding wheat flour not only is beneficial for health but it keeps the Naan soft after the cooking even if not consumed immediately, plus gives a very nice texture to it. I added minced garlic to give a mild flavor of garlic to the Naan. Unlike the restaurants where the garlic Naan is too garlicky I made a milder version using minimum garlic... just to get a hint of garlic. Here is how I made my Paneer and the Naan. Shallow fry the paneer and cashewnuts. Soak the poppy seeds in a little water for an hour and then grind it to make a smooth paste. Grind all the contents of onion masala together with a little water. Heat 2 tbsp oil in a non stick pan and add the masala and cook it on low flame till the raw smell of onion disappears and the oil leaves the edges. Now add the tomato puree ( I used the tetrapak version) and mix. Cook for 2 mins on high flame and then add about a cup of water. Let the gravy simmer for a few more mins till the fat separates. Simmering is a process in which the liquid is not let to reach the boiling point and is cooked on low heat. This is important technique especially for making curries/gravies as the spices get nicely cooked and blend with each other on low heat. Once the gravy starts realeasing it's aroma (check that, it will make you feel more hungry) add the paneer and cook for about 3 mins first on high and then on low heat. Now add the cream (keep 2 tsp of it for garnishing) and garam masala (the original recipe does not ask for it), mix properly. Remove the pan from the flame. Add the Cashewnut and garnish the curry with cream and its ready to be served with hot Garlic Naan. Sieve the flour along with the baking powder, soda and salt. Grind the garlic. Add the garlic (leave 2tsp to apply externally) yogurt and sugar to the flour. Now use the warm milk and knead a soft dough (if required used luke warm water). Apply oil and cover it with a wet cloth and leave the dough to rise for an hour or more (till it becomes double). Punch the dough and divide it into 12-16 equal parts. Make balls and leave it to rise again for an hour. Melt butter. Take each ball and flatten it on the palms and apply butter and then dust it with flour and then make balls again and leave them for 15 mins. Press a few pieces of crushed garlic on the ball and then roll the balls into 6-7 inch circles of 1/2 inch thickness.Pull it from one side to give it a pear shape. Heat a griddle. Apply water to the top of the rolled Naan and put this side on the griddle. Apply water on the other side also and then flip the Naan to roast it from the other side. Ensure that the griddle is not too hot. Smear some butter and serve hot. The other way to cook the Naan is to bake it in a preheated oven at 250 C for 6-7 mins. Of the two methods (Griddle and Oven) I personally like the Naan made on griddle. The Naan on griddle cooks fast and has a better texture and gives you the flavor of Naan made in the tandoor. Paneer dihes re my all tme fav...wat an explanation dear...loved garlic naan vry vry much...never tried...tnx a lot dear...! Gosh what beautiful colours and such a great Paneer dish. Those naan look fantastic!! LOoks so yummmm, beautiful rich gravy with yummy naan combo.. I am unable to delete those empty spaces from the blog post. Still learning..If you kindly help. Wow Pari...I am drooling over the Garlic Naan and Paneer Pasanda..yummy! !If given a choice,I too would have reacted like your kid-Naan and PBM is my all time favorite!! 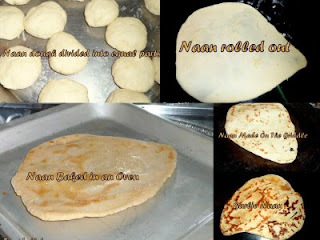 Loved your step by step recipes.Naan has come out well.Kudos to you!! wow, paneer looks yummy!..and I loved the naan recipe...I have never taken the courage to make it as I always felt I would need a tandoor. But this is great! I will let you know for sure how they come out. Thanks! 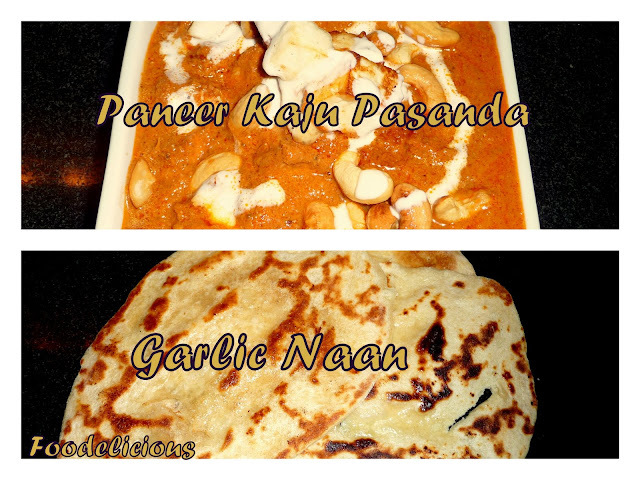 that's a delicious combination, naan and paneer pasanda; I love anything with paneer!